A commercial cargo ship making its maiden flight to the International Space Station completed a complex rendezvous early Sunday, pulling up to within about 30 feet of the lab complex and then standing by while the station's robot arm locked onto a grapple fixture. Running a week late because of a navigation software glitch, the Cygnus supply ship, built and launched as a commercial venture by Orbital Sciences Corp., was captured by Italian astronaut Luca Parmitano at 7 a.m. EDT (GMT-4) as the two spacecraft sailed high above the Indian Ocean. With a successful demonstration flight, Orbital Sciences will be clear to begin executing a $1.9 billion contract to launch at least eight space station resupply missions, part of a major NASA initiative to replace cargo capacity lost with the space shuttle's retirement. Named after the late NASA astronaut and Orbital Sciences executive G. David Low, the Cygnus supply ship is carrying about 1,500 pounds of food, clothing and other non-critical supplies. "We'd like to congratulate you on a great capture today," radioed astronaut Catherine Coleman from mission control in Houston. "Also like to say welcome aboard to the Orbital Sciences G. David Low ... a great human being who bravely explored and had a tremendous vision for the future of spaceflight. We're really proud to have the G. David Low aboard the ISS today. Thanks for all your good work." "I would like, first of all, to say that I was honored to be allowed to be part of this day," Parmitano replied. "It was really, really a pleasure and it was a privilege to work with all the teams on the ground, both from Houston, of course, from Orbital and here on the station." With Cygnus firmly latched to the end of the robot arm, Parmitano and astronaut Karen Nyberg monitored a robotic maneuver to precisely position the spacecraft for berthing at the Earth facing port of the station's forward Harmony module. If all goes well, the crew will open hatches Monday and begin the process of unloading the spacecraft and re-packing it with trash and no-longer-needed gear. 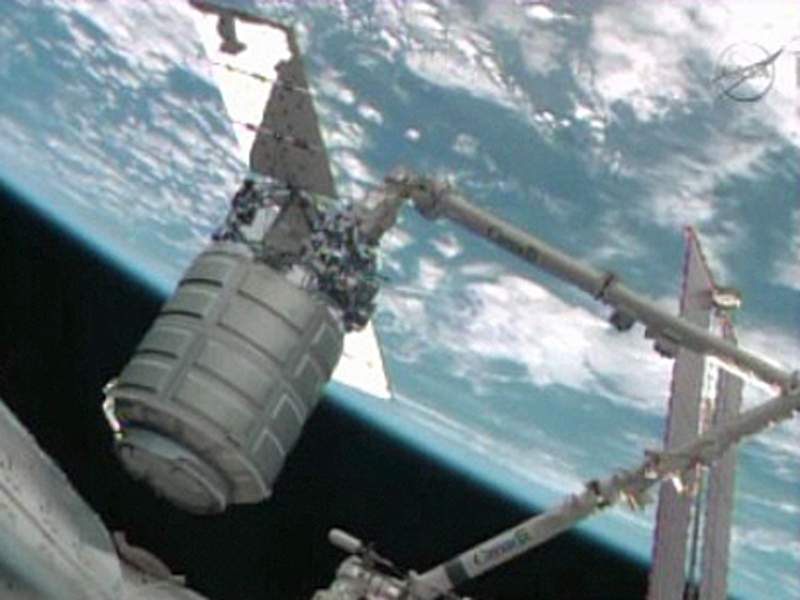 The cargo ship is expected to remain attached to the station for about a month. The Cygnus was launched Sept. 18 atop a two-stage Orbital Sciences Antares booster that took off from the Mid-Atlantic Regional Spaceport at NASA's Wallops Island, Va., flight facility. The flight plan called for a berthing at the space station four days later, on Sept. 22, but the rendezvous was interrupted by suspect navigation data. Orbital engineers quickly identified the problem and came up with a corrective software patch, but program managers opted to wait until after the launch and docking of a Soyuz crew ferry craft on Sept. 25. The demonstration flight is the final milestone in a $288 million contract managed by NASA's Commercial Orbital Transportation Services -- COTS -- program, which funded development of two commercial cargo carriers to take over U.S. space station logistics in the wake of the shuttle's retirement. The test flight included a series of engineering exercises to verify the safe operation of the new spacecraft, to test abort procedures and to verify the crew's ability to send commands as needed. After the software patch was uplinked to correct the navigation program, Orbital completed all of the test objectives. Orbital Sciences now joins Space Exploration Technologies, or SpaceX, as a commercial cargo carrier. SpaceX holds a $1.6 billion contract to provide at least 12 cargo flights to the station for delivery of more than 44,000 pounds of equipment and supplies. The company completed its own test flights earlier and has now launched two operational resupply missions. Orbital Sciences' $1.9 billion contract with NASA calls for at least eight resupply missions to deliver 20 tons of cargo. Company officials say they will be ready for their first operational mission later this year. "It's time for us really to start having flights on a regular basis and expect that the next one will be there," space station Program Manager Mike Suffredini said before the Cygnus launch. "So I'm looking at this next year, 2014, to be the year where we really settle in, where we have regular Orbital flights and regular SpaceX flights, and we actually see them within a few weeks of when we expect to have them there." Regularly scheduled flights ultimately will allow NASA "to reduce the amount of up mass we have for logistics, which we can do if we have a consistent supply chain, and really fill these vehicles up with research. That's the big transition we have to make in the next year now that we have Orbital flying as well."